Master of the early Renaissance Andrea Mantegna (Andrea Mantegna) known to the public much less than his contemporaries Leonardo da Vinci or Sandro Botticelli. Meanwhile, on the art market the emergence of Mantegna’s causing quite a stir. In 2003, the year at Sotheby’s auction for his "Descent into hell" (tempera on wood, 39×42 cm) unidentified buyer paid more than 25.5 million dollars. On beginning 2010 years this result was among the top ten auction records. Mantegna is one of the most unusual artists of the Renaissance. We don’t find it any smooth melody Botticellior melting the misty hazes (sfumato) da Vinci. Mantegna does not tend to anything lyrically feminine. This painter abrupt and harsh lines, sharp angles, clear picture. The artist of the most courageous and heroic manner, imaginable. He was born in Isola di Karturo in the family of a woodcutter and he spent his childhood on the mountain pastures. They say, for the artist’s biography significantly only who first placed it in his hand. In life Mantegna was a man that. His name was Francesco Squarcione. By and large, a major painter Francesco himself was not. It is accepted to write "Squarcione — minor artist from Padua". Years up to 30 in General, he was a tailor. And then was fond of antiquity, began to paint and to teach others, opened a workshop for a hundred people, which then turn into Padua art Academy. To his training and got Andrea Mantegna. With the youth of Mantegna was not particularly interested in paint and colour. It is much more occupied lines and shapes, optics and geometry, the laws of perspective. Andrea almost immediately overtook fellow students in the skill of drawing (even Durer would later to come to Italy to learn from his experience). A diligent shepherd boy became Squarcione favorite. 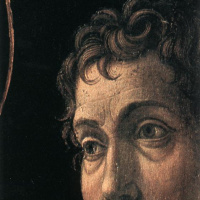 Mantegna was 12 or 13 years old when the teacher took him to his house, and then adopted. We must pay tribute Squarcione: he understood the limitations of their own gift. But he also saw what a talented stepson could go much further. In Tuscany and Rome Squarcione specially ordered casts of famous Roman sculptures. He demanded that Mantegna day and night, studied them and copied, honing skills. Squarcione infected Mantegna antiquity. At the age of Mantegna will be to convince people that anatomy of antique statues perfect anatomy of the living human body. After the statue we can read the structure of the muscle, the vein, the tension lived, skin relief. And the human body is not always able to immediately show us the beauty of the divine plan. Pretty soon, Mantegna was the first major Commission to paint the Church of St. Sophia in Padua. He did it so well that many who saw the painting could not believe that the artist is only 17. Giorgio Vasari writes that this "the thing that seems painted by the artist old and experienced". 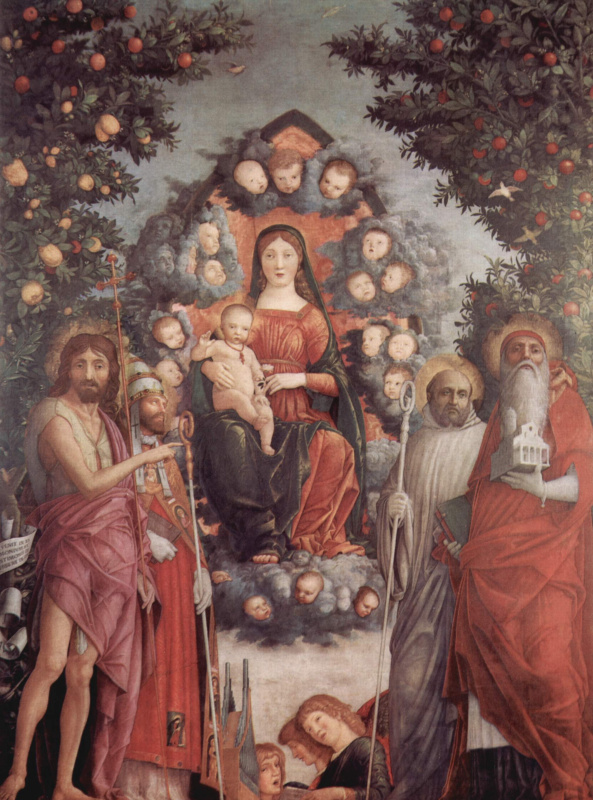 In the "learned Padua," the center for the Sciences and crafts, sometimes came Jacopo Bellini sons-artists Giovanni and Gentile. 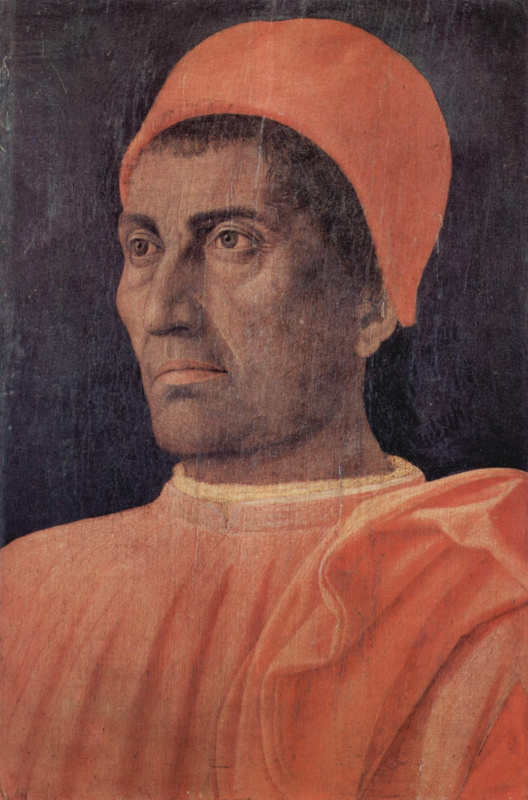 In Venice the Bellini dynasty reigned Supreme in the field of art. Mantegna became friendly with the brothers and their father, although Jacopo Bellini and considered a rival of his named father, Squarcione. Bellini and Mantegna in many respects to each other were enriched. First adopted from paguanta the desire to have a strict balance of lines. Mantegna, at last, began to show interest in the subtleties of color, in which the brothers were especially adept. The apotheosis of rapprochement with the native Bellini to Mantegna began in 1454, the year of the wedding with Nicolosi — sister of Giovanni and Gentile. Everything was never better. Only Squarcione very hard underwent convergence stepson Bellini. He considered it a betrayal. In life they were enemies. 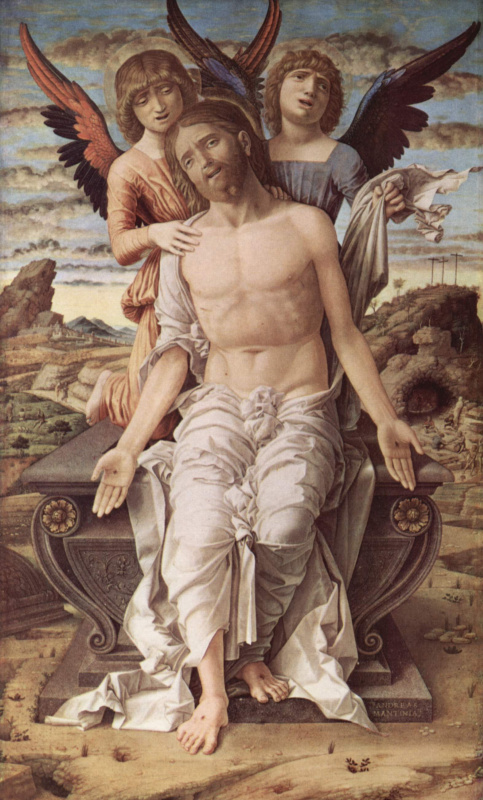 Now the painting by Mantegna in the Church. Christopher Padua, which earlier praised, Squarcione blamed on what light is. In vain, he said, Andrea was so keen on copying antique marbles. The stone is a stone! He is always cold and hard. Ungrateful Mantegna never learned to write a living human body. He will never be able to convey the flexibility and warmth in their paintings! Mantegna said that mockingly depicted Sarcone on one of the paintings in the form of unkempt and oily Martinet, but kind of admitted that he was right. He became much more attention to Scripture and the nature. This, of course, benefited him as a painter. 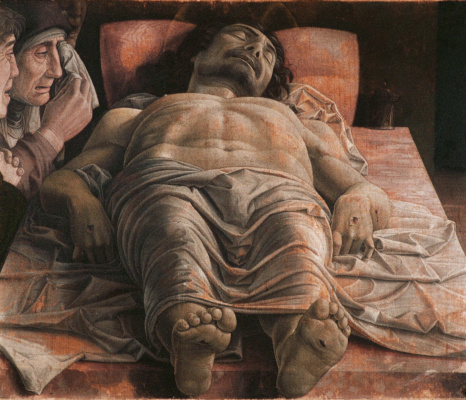 And still the most famous and mysterious painting by Mantegna is exactly lifeless body The "Dead Christ". Now it is stored in Milan’s Pinacoteca di Brera. In this complex perspective, the body of the crucified Christ did not write and do not write anymore. 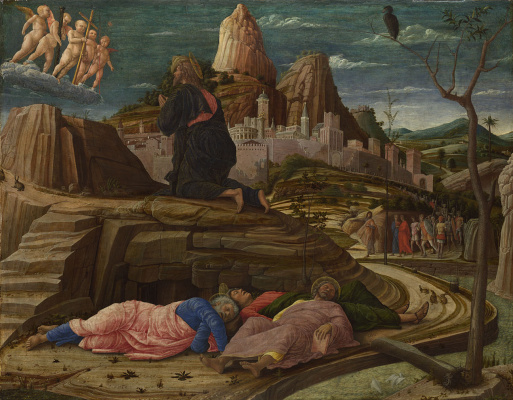 No wonder Mantegna meticulously studied the secrets of perspective. The Savior lying on his back on a narrow couch covered with a sheet. And the audience, taken by surprise, the first thing the eye rests on its spiked feet on the front edge of the blade. It’s hypnotizing and confused. After hearing about the extraordinary gift of Mantegna to create illusions, the Marquis of Mantua Ludovico III Gonzaga invited him into his entourage. The artist has painted for the Marquis room in his Palazzo, using a variety of optical tricks. Now it is known as "bride-chamber", or Camera degli Sposi. All walls and ceiling in a relatively small room, decorated with frescoes, including not less than 30 figures. The wife of the Marquis Barbara, Sam Gonzaga and his son cardinal, servants and maids — they are all so real, it seems, is about to invade the space of the room. Tall Windows, leather curtains are not true. But most impressive the ceiling light. It for forged circular parapet high open blue sky — and the sky, and the parapet is, of course, drawn. At the top, on the edge of the parapet is written the wood barrel orange. Looking from earth, begin in earnest to worry about the barrel at any time may collapse on your head. Gonzaga were very pleased with how talented a painter he had acquired at court. Not knowing what else other than despicable money to benefit your favorite artist, he devoted Mantegna in the knights. In one of the medieval statutes says that the first duty of a knight — "to live perfectly before God and before men." Few of the artists tend like. But Mantegna, a shepherd and the son of a lumberjack, always been chivalrous. Vasari enthusiastically extols his unfailing generosity and admits very rarely happens that talent and virtue the person went equally, and one is not superior to another. But Mantegna is the rare case. Thank Mantegna rattled from Venice to Padua. She has come to Rome. Pope innocent VIII invited the artist to paint the Belvedere — the papal summer Palace. 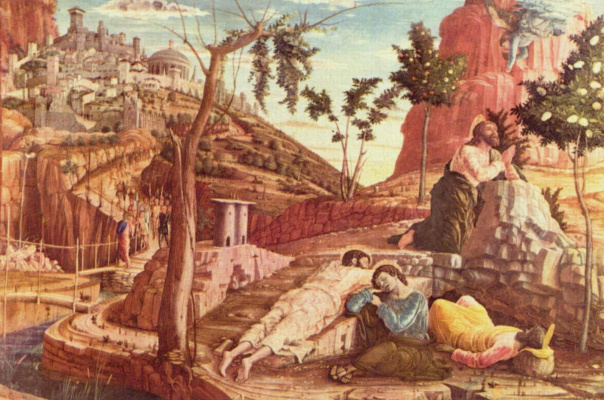 Now it is one of the most famous museums, and when invited to work Mantegna, construction was just completed. 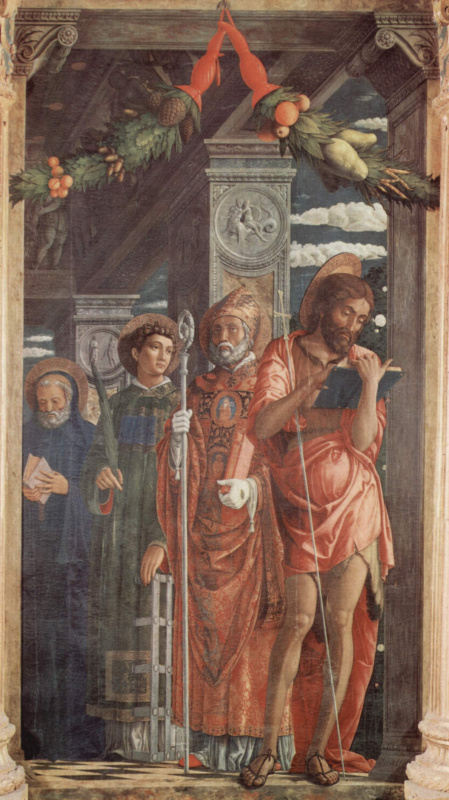 To start Mantegna was offered with a small chapel, which he, with his usual ability, had to "open up" from the inside and fill with air and space. Innocent VIII was always forgetting to pay the artist for the work. Mantegna then resorted to the picturesque allusion. 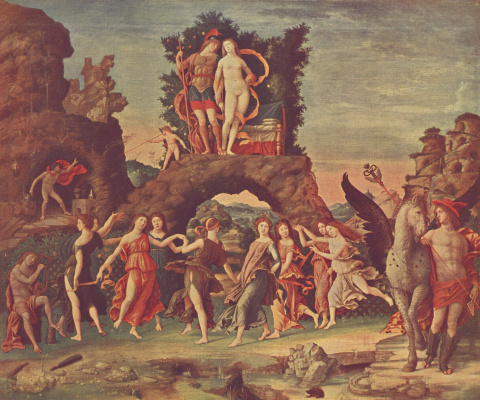 Instead of allegorical figures of Virtues in a fresco he painted Modesty. Dad appreciated the subtlety of the hint, but instead of money he gave the advice: "To Modesty was in good company, do with her still and Patience." 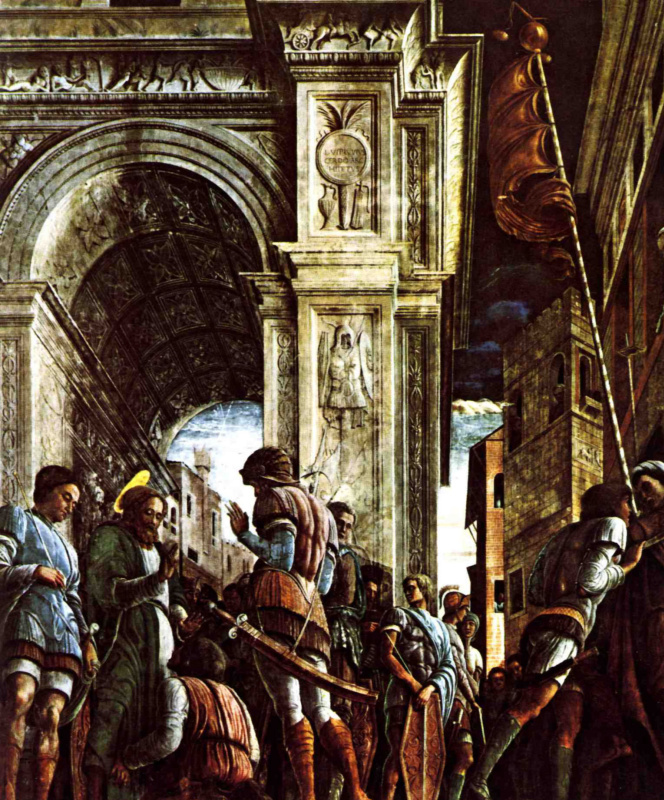 Because the lifetime of modesty or virtue of the later circumstances, Andrea Mantegna is still underrated artist. This is not quite true, as without it in the future, all of the following High Renaissance could have a different appearance. A real breakthrough Mantegna in the creation on the plane of illusion of space staggering no less than the illusory breakthrough into the sky on his frescoes in the Camera degli Sposi.